I build these loaded guards to order with a 3 week minimum build time. 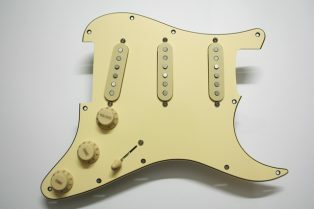 I can build these in white, parchment, mint, and black in right handed. For left- handed I can build them in black, white or parchment. I can also build them in white pearloid but please contact me for pricing. 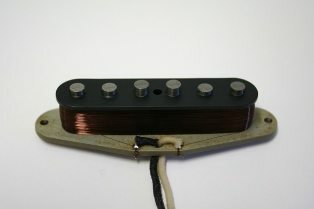 I wind these roughly to ’68 Strat specs with a little more in the bridge. 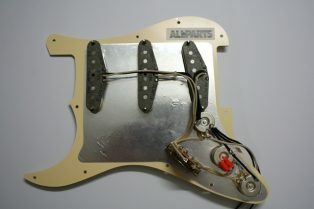 These are essentially a lefthanded pickup for a right handed guitar. 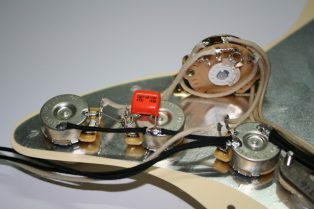 The A and B string magnets are swapped around to create this effect. 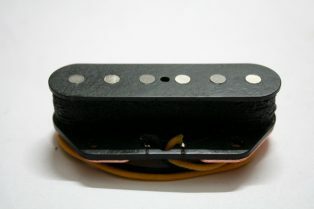 This set has a non reverse wound middle pickup but I will wind the middle pickups reverse for humbucking in position 2 and 4. I have sold bucket loads of these Roodoo sets over the years. 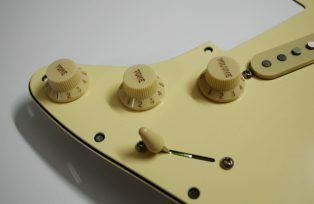 My most memorable customer was Frank from Florida who put his set in a Strat Plus formerly owned by Bill Carson himself! Here are some sound clips of the Roodoos in action!